As I recall, my first exposure to the phenomenon that is Grace Jones was the car crash TV experience of her infamous appearance on the Russell Harty chat show in the mid 80s. I guess that at the time she was out promoting Island Life (her Best Of compilation) and Slave to the Rhythm was vamping its way up the charts. Settling down to an undemanding 30 minutes of light celebrity chat I was confronted by the sight of Jones pummeling Harty (in hilarious flappy hands fashion) on live TV because he had the gall to slightly turn his back on her as he tried to interview one of his other guests. It was all way too much for my sensitive teenage self and I ran away, cowering, to hide behind the sofa. And that was that…. …until, that is, I was given a copy of the wonderful compilation Funky Nassau: The Compass Point Story. Amongst its sunny grooves and extended funk work outs is My Jamaican Guy (or My Usain Bolt Guy as my 8 year old son likes to sing) an infectious number that, although far from Jones’ finest song, was enough to pique my interest in her back catalogue and, following some internet research, it wasn’t long before Nightclubbing had risen to the top of my ‘most wanted’ list. Nightclubbing is no way near as scary as my 14 year old self would have feared – listening to it, it seems as though Jones had yet to develop that terrifying yet cartoonish (if you’re reading this Grace, please don’t be angry) diva thing – on Nightclubbing she comes across as ominous and otherworldly but, crucially, genuine and real; more ‘Alien’ than ‘Godzilla’ if you see what I mean. Consistently excellent throughout and surprisingly accessible, I suppose Nightclubbing’s most well known track is Pull Up to The Bumper; a song so crammed full of innuendo that it is incredible that Mike Read (or any of his virtuous, upstanding chums at Radio 1 at the time) didn’t choke on their (hairy) cornflakes and immediately ban it from the airwaves, hence saving our delicate sensibilities from its possibly prurient content whilst they could carry on….doing all that fine work for charity! But Pull Up To The Bumper is by no means the standout in the set, just one of the many highs. It is preceded by Walking in the Rain, a song that sounds like it could have been written for a James Bond film and a hell of a lot better than A View to a Kill it is too (not hard admittedly). Following it is Jones’ radical reinterpretation of Bill Withers’ Use Me which is transformed from a soulful strumalong into a gargantuan slab of reggae/funk that crawls along like some slithery, hungry jungle-based animal for its riveting five minutes or so – listen to it and tell me you don’t think of a crocodile or python or something. 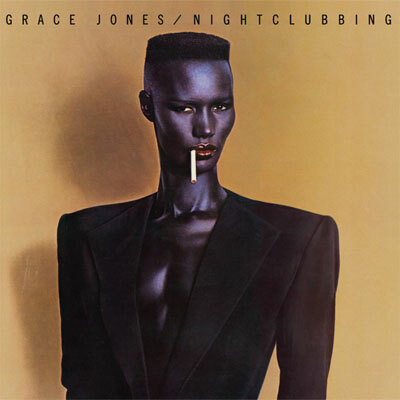 One thing that speaks volumes about the quality of Nightclubbing are the cover versions – as well as the ones already mentioned, Jones also has a stab at Iggy’s Nightclubbing (unsurprisingly, given the album’s title) and somehow makes it her own, whilst sounding unmistakably Iggyish in the process. Jones also covers Sting’s Demolition Man (from Ghost in the Machine) and, whilst it’s easy to forget that Sting used to write good songs every now and again, next to this The Police sound decidedly safe (I like both versions and, to me, neither sound like filler – still not sure about what constitutes ‘filler’, despite Nick and Rob’s best efforts to educate me – but Jones’ version is surely less fillery than The Police’s). And there we have it – Nightclubbing: exciting, vital, as fresh as it ever was and no where near as scary as one might expect. Rob listened: I had the same introduction to Tom, and the same reaction. Growing up I had no idea what Grace Jones was. Singer? Model? Robot? Insurrectionist? Mental case? A prim 10-year old, I rejected her. Way too scary. Despite the fact that less than 5 tears later I’d be dragging Public Image Limited and The Fall into the house, I retained a subconcious view of Jones as a dangerously transgressive figure best avoided, a Ballardian anti-hero. Of course, throughout that time her music was seeping in via the radio and TV, but really it was only seeing her astonishing performance at last year’s Diamond Jubilee concert that the penny dropped and I began to think of her as an International Treasure. ‘Nightclubbing’ was great, although credit to Graham for observing that ‘having Sly and Robbie as your rhythm section helps’. I’ve since bought ‘Warm Leatherette’ which on early inspection sounds equally alluring and distinctive. I like Grace. Nick listened: I know this pretty well, having got acquainted with it a decade or or so ago when I worked in the library – we had a copy on 12″ and there was a period when it got a battering on Friday afternoons. As intimated by Tom and Rob, Grace is an amazing, ageless, alien presence in our culture; I think my first encounter with her was in the film Vamp, which was… influential… to my pre-adolescent self. As I said on the night, I hope the new Daft Punk album sounds like, and is almost as good, as this. A brilliant record. I should probably buy my own copy now. Graham listened: For all the reasons the others have mentioned, I never understood, or liked, Grace Jones. She seemed to emerge from a gratuitous New York nightclub/fashion/modelling scene which I completely despised in the late 70’s/early 80’s. I was convinced she only got the breaks because of her physical attributes and that there were others more deserving of the support from record companies. Her image and diva-like behaviour left me cold. This album felt cold and detached with her image being as important as the sound. Annoyingly, it is very good.